Trepans and trephines have been used to treat head trauma and other conditions for thousands of years. Our current exhibition A History of Emergency and Trauma Surgery contains a display case dedicated to trephination (as well as illustrations of head injury procedures). Practical Cases and Observations in Surgery (1751) by Percival Potts reports successful use of trephination to treat serious head injury caused by a kick from a horse, a common and very serious injury. Potts’s Chirurgical Works (1779) contains an illustration of trepan procedure on a patient (who looks understandably anxious). Another variant of the trepan can be seen in the 2nd edition of College founder Peter Lowe’s book The Whole Course of Chirurgerie (1612) . 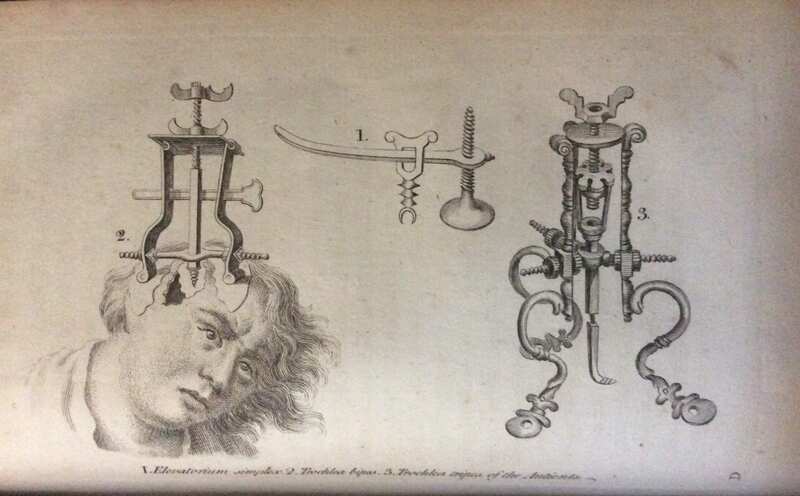 In its Sixth Treatise, Chapter 10, ‘Of Woundes in the Head’, Lowe expresses caution in the use of the instrument, which at the time was quite commonly used to relieve pressure on the brain resulting from depressed fracture. In line with the general focus of his book, Lowe is concerned about unskilled surgeons carrying out the procedure. Looking at the array of instruments illustrated below, it is easy to see why. Our exhibition also features our 18th century trephine set (below). The set was made by Edward Stanton of Lombard Street, London, between 1738 and 1744. The difference between the trepans as shown above, and the trephine below, is described by John Woodall in his book The Surgeon’s Mate (1639). Woodall claimed to have invented the modern trephine, outlining the improved features of the new instrument. 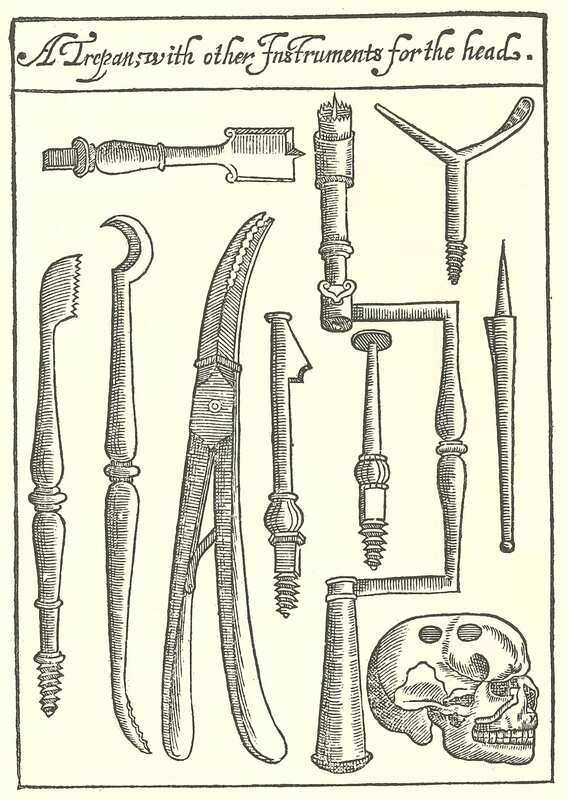 The trephine handle was t-shaped rather than a two-handed brace-and-bit, meaning the tool could be used with one hand. Next, the cutting head was cone shaped, making it easier to extract the disc of bone from the skull. Also, to improve cutting, spiral grooving and spiral cutting teeth were used. 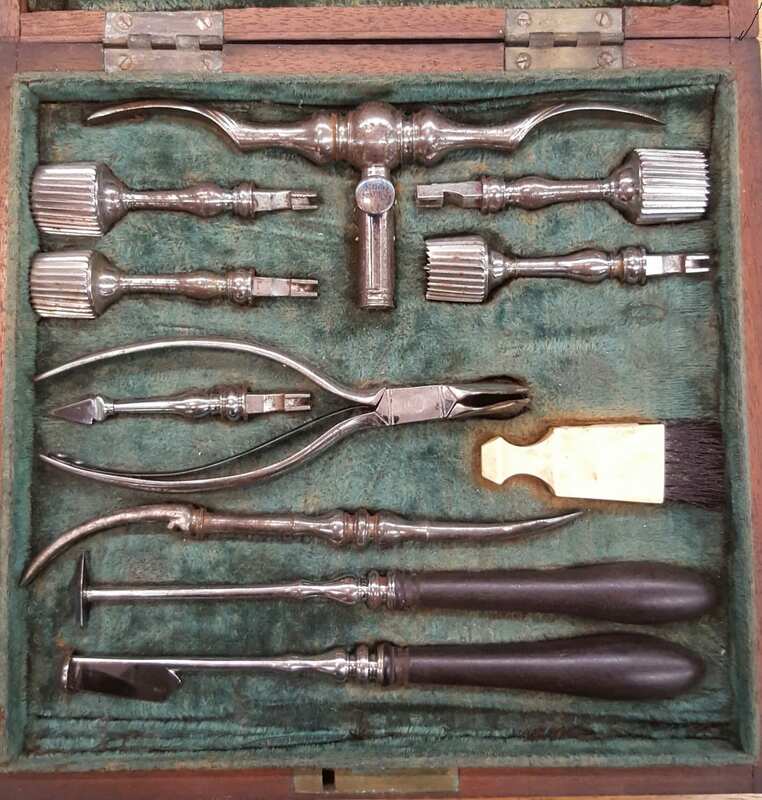 As well as the four trephines of different sizes and handle, the set contains a perforator, a double ended elevator, raspatory, lenticular, extracting forceps, and a brush, used to clean the trephine teeth. Similar instruments were used well into the 20th century. 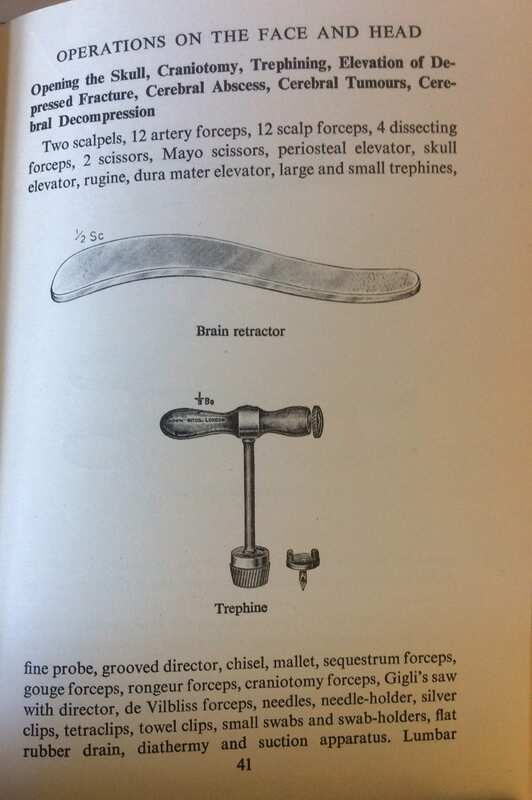 The illustration below from a 1950s edition of Surgical Instruments and Appliances used in Operations by Burrows and Raven shows a very similar instrument to that in our set. Our exhibition is in the College’s Crush Hall until the end of April 2015. 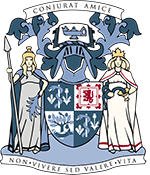 To visit please get in touch by emailing library@rcpsg.ac.uk or calling 0141 221 6072. Alternatively, pop in on a Monday afternoon between 2pm and 5pm.